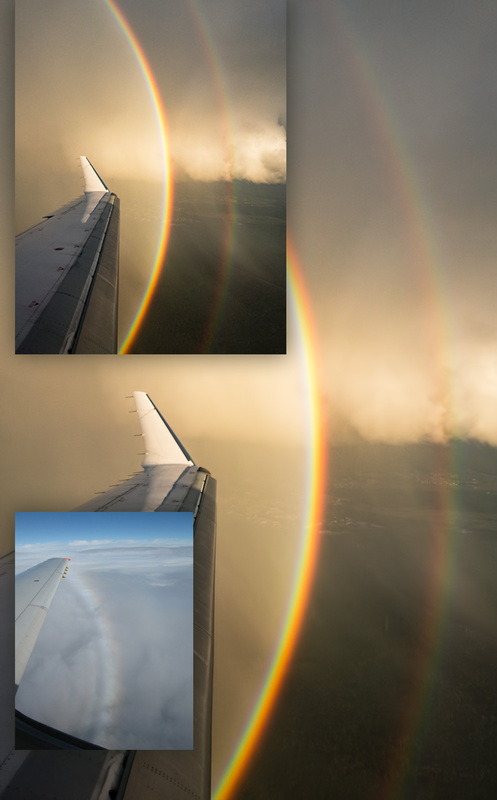 Rainbows brightened Mark McCaughrean’s descent into Frankfurt, Germany. It was 30 minutes before sunset as the aircraft descended through strong showers. “The rainbows extended further up and over, as you might expect, but it was not possible to capture the full extent with the FOV of my phone's camera. The yellowish cast comes because the sunlight was diffusing through the rain and cloud on the horizon. A cloudbow with an outer secondary bow by Eva Seidenfaden (Paraselene). Compare with the above, lower altitude, scene. Narrow bows and saturated colours are replaced by wide diffuse bows of sparse pastel shades. Water drop size makes all the difference. Raindrops are upwards of 1mm diameter. Cloud droplets are 10 to 1000X smaller. The smaller droplets diffract light strongly spreading the rainbow and diluting colours. Raindrops diffract also but the effect on rainbows is less.